Are you tired of tossing and turning? Do you cut off circulation in your arms or your legs while you sleep? Choose the best body pillow may be the solution. They help you keep your back, hips, and head comfortably aligned for the best night’s sleep. If you suffer from back pain and you sleep on your side, it can help you get back in alignment and get back to sleep. Body pillows are also excellent for pregnant women, who need extra support for their growing stomachs and extra care to relieve new pains. For pregnant women, body pillows can mean the difference between a comfortable night’s sleep and one more restless night of tossing and turning. We’ve identified and reviewed the ten best body pillows to help you make a decision. Below our body pillow reviews, refer to our Buyer’s Guide to better understand what specifications will be most relevant in your search for the right one. Read our FAQ to make the most informed choice about which model will work best for you! 1. What is a body pillow? 2. When were they invented? 3. Why are they good? 4. Why are they good for side-sleepers? 5. Why are they good for pregnancy? 6. How do I keep it clean? The Moonlight Slumber – Comfort U may be the best body pillow for side sleepers. If you sleep on your side, it will help you reduce swelling in your feet and your legs by improving blood circulation. 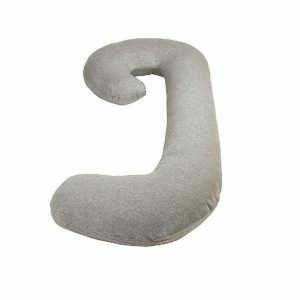 The oversized pillow is shaped like a horseshoe, and it is long enough to support both sides of your body. By aligning your hips, the pillow helps to eliminate tossing and turning while you sleep just like the The Moonlight Slumber – Comfort U. The Moonlight Slumber Comfort U also regulates body temperature and can alleviate pain in your back, neck, and shoulders. It is made of hypoallergenic, synthetic down, and can be thrown in any standard washer and dryer. It is 60 x 7 x 35 inches. However, many consumers report that it is particularly flat. The Moonlight Slumber tends to sag, conforming too much to the weight of your body. They are meant to provide support, and the Moonlight Slumber may flatten too easily beneath you. Made of hypoallergenic, synthetic down. The Moonlight Slumber – Comfort U is our Editor’s Choice for Side-Sleepers. Its horseshoe-shaped makes it easy for side-sleepers to avoid sleep-related pain. It is hypoallergenic, made of synthetic down, and it can be machine-washed. Though it sags and flattens easily compared to some of the others reviewed here, the massive pillow can align your hips, reduce swelling in your feet, and improve blood circulation. The snuggL may be the best body pillow for pregnancy. It was designed by doctors to reduce strain on the lower back and alleviate back pain. It’s also a great option for side-sleepers. Its special “L” shape replaces the traditional one beneath your head while also allowing you to wrap your legs and arms around it. The stuffing contains a proprietary blend of micro gel fibers manufactured to adapt to the needs of your specific body. 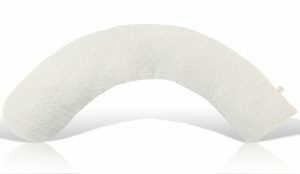 With a medium firmness, this stuffing provides a contoured support system for your ideal sleep. The pillowcase is even designed for comfort. It’s made of 100% cotton and boasts a thread count of 300. A zipper allows for easy removal to assist in machine washing. This product from The snuggL is 20.2 x 17 x 8.5 inches. However, due to its size, it would likely not be appropriate for anyone six-foot-tall or taller. Consumers also report that it is not ideal if you like to turn in your sleep, as it only frames one side of your body. “L” shape ideal for pregnant women. Made with micro gel fibers. Does not wrap around your body. Too small for tall sleepers. The snuggL is our Editor’s Choice for Pregnant Women. It is one of the best body pillows for pregnant women because of its unique L-shape, shared by no others on this list. The bottom of the L supports the sleeper’s head, and the rest of the tube-shaped pillow can align the sleeper’s knees, hips, and back. It is made with micro gel fibers and comes with a soft, luxurious pillowcase. Though it does not wrap around your body and may be too small if you’re a tall individual, it’s a great option for shorter side-sleepers. The Leachco Snoogle Chic XL is about six-feet-long, making it ideal for tall people unsatisfied with the fit of other body pillows. Its extra-long midsection provides full back support as well as stomach support for pregnant mothers. If you suffer from fibromyalgia, arthritis, neck, back, or hip pain, this can help. With the Snoogle, you’ll have no need for multiple body pillows to keep you comfortable through the night. Its unique C-shape supports side-sleepers’ hips, backs, and necks. The hooked top curves beneath your head. The curved bottom tucks between your legs. And that midsection provides versatile support, depending on how you position yourself. 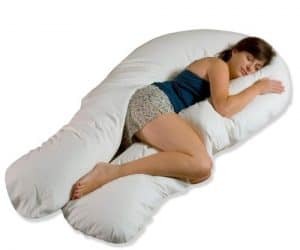 The Snoogle is made of polyester stuffing and is covered in 100% cotton fabric fibers. The Snoogle provides comfort and support without any extra body heat. However, some consumers report that the cover felt scratchy and bothered them while trying to sleep. The Leachco Snoogle Chic XL is our Editor’s Choice for Tall People. It is about six-feet-long, and its unique C shape curves to tuck beneath your head and legs while you sleep. Its extra-long midsection provides extra back or belly support for the taller sleepers in the world. Though the cover materials may feel scratchy, the covers are made with 100% cotton fibers and reduce the buildup of body heat. 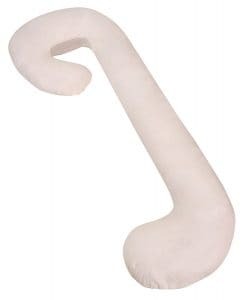 The Body Pillow CMD9000 High Class is a tube-shaped pillow made of 100% polyester filling. Its cover is made of urethane, and its smooth texture is meant to provide comfort. The knit material of the cover also stretches in both directions. Though the COMODO body pillow is not made of memory foam, its polyester filling functions similarly. The pillow retains its shape and firmness, offering resilient support and springing back to its original configuration after bearing weight. The CMD9000 from COMODO is 63 x 19.7 x 9.8 inches. However, its tube shape may not be ideal for side sleepers and may not discourage tossing and turning. The CMD9000 High Class is made in Japan and shaped like a long, traditional pillow. Its polyester filling and urethane cover provide excellent comfort, and the polyester filling functions like memory foam. It springs back and retains its shape after sustaining pressure. Though its tube shape may not be ideal for side-sleepers, the knit material of the cover stretches in two directions to make moving about at night easy and comfortable. The Luna Lullaby Luna Dream is 48 inches long with an outer contour of 62 inches. Its curved shape makes it ideal for you if you sleep on your back or your stomach. The contour of this product distributes pressure throughout your entire body while you sleep, encouraging muscle relaxation and improving blood circulation. This pillow from Luna Lullaby would also be a comfortable choice for pregnant women suffering from lower back pain. The pillowcase is luxurious and removable, and it is made of delicate and soft material. The stuffing in it is made of 100% polyester. No flame retardant materials were used in this pillow, making it a safe choice for post-pregnant sleepers. However, if you’re interested in using it as a way to support your baby while breastfeeding, some consumers report dissatisfaction. It proved too soft and floppy, and younger babies tended not to fit properly between mother and pillow. Great for those who sleep on back or stomach. The Luna Lullaby Luna Dream is a curved and contoured body pillow that falls between a horseshoe-shaped pillow and a tube-shaped pillow. As a result, it evenly distributes pressure and encourages muscle relaxation while improving the circulation of your blood. The stuffing consists of 100% polyester, and no flame retardant materials were used by the manufacturer. Though this one would not be ideal for breastfeeding mothers, the lack of flame retardant materials ensures its safety for new mothers. The Snuggle-Pedic Shredded Bamboo Combination Memory Foam does not need to be fluffed throughout the night in order to maintain its shape. 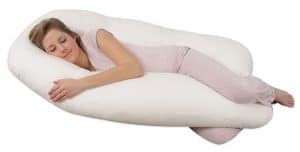 Made of shredded memory foam, the stuffing in this pillow conforms to your body and provides hypoallergenic support. The proprietary mix of Biogreen memory foam and certified memory foam mimics mattresses made by Snuggle-Pedic. The memory foam contents never go flat in the night. With its tube shape, this is a great choice for anyone sleeping in any position. The cover is made of viscose of bamboo, polyester, and lycra, ensuring you’ll remain cool and comfortable throughout the night. The Snuggle-Pedic body pillow is 15.5 x 13.1 x 4.9 inches, making it one of the smaller pillows reviewed here. However, consumers report that the body pillows arrive deformed. The shredded memory foam gathers in lumps during shipping. In some cases, they were not stuffed fully. Great for all sleeping positions. One of the smaller body pillows reviewed. The Snuggle-Pedic Shredded Bamboo Combination Memory Foam is made of shredded memory foam, so it never flattens or sags. It conforms easily to your body and provides comfortable hypoallergenic support. 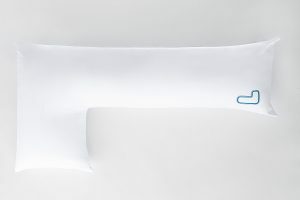 Thanks to the composition of its pillowcase, the pillow regulates your temperature throughout the night and ensures you remain cool and comfortable. Though the stuffing can sometimes be lumpy, and this one is particularly small, the Snuggle-Pedic is great for any sleeping position. The Leachco Snoogle Chic Jersey measures 7.8 x 25.5 x 58.8 inches. Its extra-long midsection provides either full back support or stomach support for pregnant mothers. Though the material of the stuffing is not described, the cover is made of 100% cotton fabric fibers. The Snoogle provides comfort and support without any extra body heat. However, some consumers report faulty manufacturing. The body pillows broke down after a few months or ripped sooner. The Leachco Snoogle Chic Jersey sports a unique C shape that curves to tuck beneath your head and legs while you sleep. Its long midsection should be of extra interest to anyone wanting more back or stomach support. The stomach support combined with the lack of additional generated heat makes it a solid choice for expecting mothers. Though some pillows broke after regular use, the Leachco Snoogle remains a valid choice. The Five Diamond Collection Bamboo Covered 60″ Full Body Stay Cool Shredded Memory Foam can be thrown into any traditional washer and dryer. Thanks to the shredded memory foam stuffing, this versatile and resilient product will never flatten or sag. The fabric cover is made of polyester and breathable, ventilated bamboo. The tube-shaped pillow is 60 inches long and weighs less than nine pounds. It is hypoallergenic and dust mite resistant. 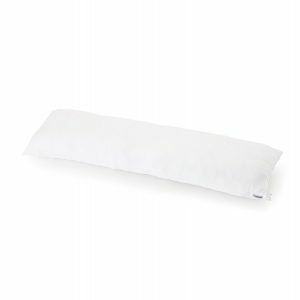 Due to the breathable fabric and the open composition of the shredded memory foam, it stays cool throughout the night. Many pillows—particularly those made with traditional memory foam—cause heat to build up in the night. This offering from Five Diamond Collection solves the heat problem and regulates your temperature. However, some consumers report that this one is too firm and ships with an awful chemical smell. Made with shredded memory foam. 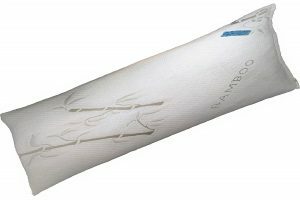 The Five Diamond Collection Bamboo Covered 60″ Full Body Stay Cool Shredded Memory Foam is entirely machine washable and made of shredded memory foam. This one will never flatten or sag, and it will remain cool throughout the night. It is hypoallergenic and dust mite resistant. Though some say it is too firm to the point of being uncomfortable, its length should provide excellent back support for side sleepers. 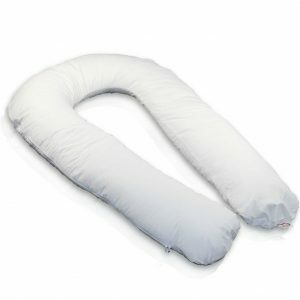 The Leachco Back ‘N Belly Contoured is one of the only horseshoe-shaped body pillows reviewed on this list, and Leachco offers a particularly unique shape. The hourglass contouring of the pillow mimics the shape of a human body, allowing for ideal comfort as you sleep. No matter how you like to sleep, the Leachco Back ‘N Belly curves to fit you. It keeps hips aligned and ensures you sleep in a comfortable position to relieve back and joint pain. The Leachco Back ‘N Belly Contoured also helps relieve fibromyalgia, carpal tunnel, sciatica, gastric reflux, and nasal congestion. The pillowcase can be removed easily for machine washing, and the body pillow can be contorted to support multiple sleeping positions. Pregnant women and side sleepers should find ample back and stomach support. However, some consumers report that this product utilizes a hard, painful seam that can cut into your neck and leave marks. It may also disrupt or disturb a peaceful night of sleep. The Leachco Back ‘N Belly Contoured is a horseshoe-shaped pillow contoured like an hourglass to conform to the shape of your body. It would satisfy anyone who sleeps in any position. Both pregnant women and side sleepers should find suitable support from it. Though it does feature a seam that may cut into your neck, its versatility makes it worth considering. The Comfort U Total Body Support from Moonlight Slumber is an excellent body pillow for side sleepers. If you sleep on your side, it will help you reduce swelling in your feet and your legs by improving blood circulation. The oversized pillow is shaped like a horseshoe, and it is long enough to support both sides of your body. By aligning your hips, the pillow helps to eliminate tossing and turning while you sleep, cocooning you in comfort. 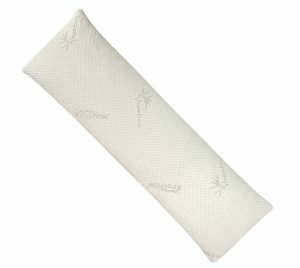 The Moonlight Slumber pillow also regulates body temperature and can alleviate pain in your back, neck, and shoulders. It is made of hypoallergenic, synthetic down, and can be thrown in any standard washer and dryer. However, many consumers report that this one is particularly flat. The Moonlight Slumber tends to sag, conforming too much to the weight of your body. These pillows are meant to provide support, and the Moonlight Slumber may flatten too easily beneath you. The Comfort U Total Body Support from Moonlight Slumber makes it easy for side-sleepers to avoid sleep-related pain. It is hypoallergenic, made of synthetic down, and it can be machine-washed. Though it sags and flattens easily compared to some of the others reviewed here, the massive pillow can align your hips, reduce swelling in your feet, and improve blood circulation. If you’ve never purchased one before, this buyer’s guide should prove useful to you in your search and your decision-making process. They come in a number of shapes. The shape you choose will depend on your sleeping position and your needs. Horseshoe-shaped, or U-shaped — These can encircle your entire body and be placed in a number of positions. No matter your sleeping style, a horseshoe-shaped or U-shaped pillow should be helpful. Tube-shaped, full-length, or bar-shaped — These are straight and long as if several traditional pillows were sewn together. Tube-shaped pillows are better for people who sleep on their sides than for people who sleep on their backs or stomachs. C-shaped, or bean-shaped — These are a cross between the tube-shaped and the horseshoe-shaped. They come in a number of configurations and support mostly side-sleepers and pregnant women. L-shaped — These combine a tube-shaped pillow with a traditional pillow, making them ideal for pregnant sleepers and side-sleepers who want to ditch their traditional pillow entirely and rely only on their body pillow. They can be made from any number of fabrics and fibers. Your decision here will largely be a matter of preference, as all materials have pros and cons associated with them. Cotton body pillows cost less than others, but they may also wear out sooner. Foam body pillows are great for anyone needing back pain relief or joint pain relief, as they provide more support and stability than most other pillows. However, they tend to be more expensive. Shredded memory foam pillows also tend to get lumpy. Down body pillows—sometimes made with synthetic down—are more expensive and higher quality than cotton body pillows, but they do not provide the same level of support as the memory foam pillows. Down and synthetic down pillows also tend to get uncomfortably warm. Many of them are hypoallergenic and resist dust mites. If you suffer from allergies, pay attention to which one that will accommodate you and your needs. Everyone has a preferred sleeping position. Some of us sleep on our stomachs, or our backs, or our sides. Different body pillows can have different compatibilities and effects on these sleeping positions. If you sleep on your side, most body pillows should be fine for you. All of them are long, and the length is the important factor for side-sleepers. Make sure you find one that will fit comfortably along your torso and between your legs. If you sleep on your back or your stomach, you’ll probably prefer a horseshoe-shaped pillow. A tube-shaped pillow is unlikely to help you. A horseshoe-shaped pillow can fit beneath your neck and your knees, offering you support in areas most prone to painful contortions. If you tend to switch back and forth between sleeping positions, you might prefer a horseshoe-shaped pillow. Because they can be arranged in many different positions, horseshoe-shaped body pillows tend to be more versatile and can accommodate you throughout the different stages of your sleeping patterns. Body pillows can be firm, soft, medium-soft, or anything in between. The comfort of your body pillow will largely depend on your preference in terms of firmness. Many of them are soft, and those made with memory foam tend to offer the most firmness. Because they tend to bend quite a lot to reach the spaces beneath your neck and between your legs, few body pillows will be as firm as some mattresses or pillows. If you want a particularly soft pillow, try out cotton or down body pillows. But if you need extra firmness or support, a memory foam pillow will be your best option. Please refer to the following FAQ section for more information on body pillows. They are designed specifically for providing more support to your body while you sleep than the traditional pillow and mattress combination. Because they come in multiple sizes, shapes, designs, and makeups, defining a body pillow in specific parameters can prove difficult. Body pillows attempt to solve several problems associated with sleeping on a mattress that does not conform specifically to your body. They are as old as pillows themselves, which date back to Mesopotamia in 7000 BCE! Those pillows were made of stone, however. Softer, fabric pillows came into popular use during the times of the Greeks and Romans. Pillows have been made in all manner of sizes, in all manner of places, for centuries! However, the modern body pillow came into popularity within the last few decades. They solve a number of problems. If you toss and turn too much in the night, they can keep you still and stable. They can help you maintain a consistent sleeping position throughout the night. They also provide a significant amount of support when you are sleeping. A good one can alleviate suffering from headaches, insomnia, fibromyalgia, nasal congestion, chronic back pain, chronic neck pain, and poor blood circulation. Because they relieve stress to your joints, these pillows can even relieve symptoms of arthritis. They can be of particular comfort to pregnant women and the elderly. Both groups suffer from more back and hip pain than average, and body pillows are ideal for resolving joint- and muscle-related ailments. Most sleepers find additional practical uses for body pillows. If you like to sit up in bed and watch TV, it can be used to make you more comfortable. If you like to be extra comfortable on your couch, a body pillow can come with you and give extra support to your lower back. Experts recommend that people who sleep on their sides put a pillow between their legs to keep your back in alignment. It can serve simultaneously as a pillow for your head and as a pillow between your legs. When you sleep on your side, your upper leg pulls your spine out of alignment and stresses your hips and lower back. The body pillow eliminates this problem. By putting it between your knees, you raise your upper leg, prevent it from pulling on your back, and reduce the strain that comes from sleeping on your side. The less irritation caused to your back, the less pain you’ll experience! But they can be useful for any kind of sleeper, depending on their configuration. If you sleep on your back, for instance, a horseshoe body pillow can support your neck and your knees, creating a more ergonomic sleeping position. Pregnant women tend to love body pillows. Whether you are in the early or late stages of your pregnancy, it can do a lot of good for you. Many of them are designed specifically with pregnant women in mind! Body pillows alleviate back and hip pressure. Because pregnant women face an increase in back and hip pressure, body pillows help relieve symptoms. As you face the later stages of your pregnancy, support for your stomach will become increasingly important. They also increase blood circulation, which is particularly important for pregnant women. Blood needs to be able to reach the baby and all your body parts! They also help keep you calm, lower your heart rate, and stimulate a deep, calm sleep. Many of the products reviewed here are entirely machine-washable! Just throw them in the washing machine and the dryer, and it will be as clean as when you purchased it. However, some cannot be washed. Most of these come with removable pillow cases, which typically can be machine-washed without trouble. If you are an expecting mother preparing to breastfeed a baby, it’s important to find one that will be easy for you to wash. The options that are 100% machine-washable will likely be your best choice. If you’re looking for a fast and easy way to get a better night’s sleep and relieve the pain you feel when you wake up in the morning, a body pillow may be a good experiment. Especially for pregnant mothers, they can make life easier and more comfortable. When you’re making your selection, keep in mind your own sleeping position and height. Choose a non-irritating material that will keep you cool, and test out different configurations of sleeping with the pillow.